ItemI-52068 - "Stave River below the falls"; Stave Falls power project; photograph no. 9. ItemI-52069 - "Stave River Falls"; Stave Falls power project; photograph no. 8. ItemI-52583 - "Vancouver Power Co. house No. 1, Coquitlam-Buntzen development, B.C.E. Railway Co. Ltd.". ItemI-52584 - "Woodworth Lake development at Prince Rupert; interior machinery". ItemI-52586 - "Exterior of Anyox Creek powerhouse, Granby Consolidated Mining and Smelting Co., Anyox". ItemI-52587 - "Vancouver powerhouse No. 2, Coquitlam-Buntzen lakes development, B.C.E. Railway Co. Ltd., Vancouver Power Company". ItemI-52588 - "Eastwood multiple arch dam at Anyox, Granby Consolidated Mining and Smelting Co. Ltd.". ItemI-52589 - "Eastwood multiple arch dam at Anyox, Granby Consolidated Mining and Smelting Co. Ltd."
ItemI-52590 - "Larner surge tank, Granby Consolidated Mining and Smelting Co., Anyox, BC." 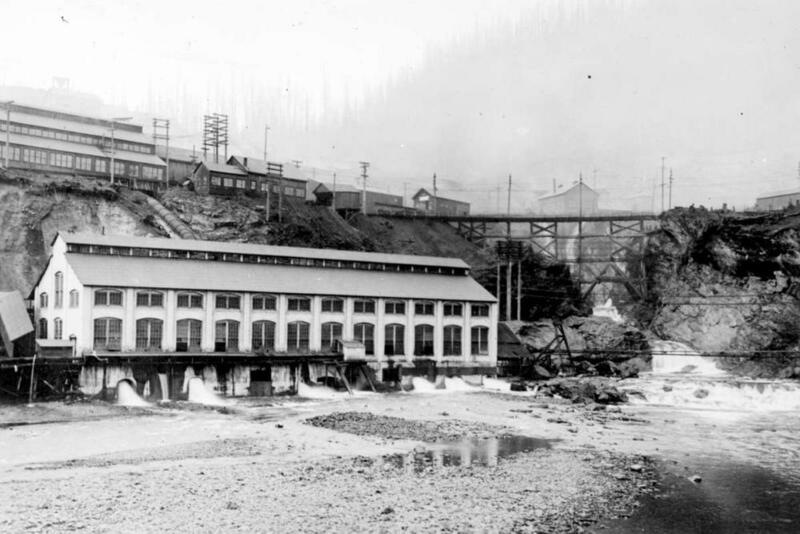 Item I-52586 - "Exterior of Anyox Creek powerhouse, Granby Consolidated Mining and Smelting Co., Anyox".